Offense was in short supply during the New England Patriots’ hard-fought 13-3 victory over the Los Angeles Rams in Super Bowl LIII on Sunday. While many found the defensive battle “boring” – note the many “Maroon 5, Rams 3” memes – the same cannot be said for the commercials, which delivered more memorable moments than the game had touchdowns (one). As always, it’s just as fun to dissect what transpired off-the-field than what happened between the lines. While the ads certainly sparked a lot of discussion, other morning-after topics include the shirtless Adam Levine fronting Maroon 5 in a widely panned halftime show, the glaring lack of African-American drummers during the halftime drum line show, Big Boi’s fur coat, and the Rams’ male cheerleaders, to name a few. Social media weighed in on all of the above and more, if you were too engrossed in the game to notice. Personally, one of my favorite ads was the NFL’s two-minute spot to promote its 100th anniversary, featuring a who’s who of past and present NFL stars tackling each other in a ballroom – prompting many internet jokes about Rams’ running back Todd Gurley rushing for more yards in the commercial than he did in the game. WalMart’s “Famous Cars” ad that featured famous fictional cars – the “Scooby Doo” van, the “Back to the Future” DeLorean, and the “Knight Rider” Firebird, among others – to promote its buy online, pick-up curbside grocery service, an offshoot of the popular buy online, pay in-store (BOPIS) model. An awed customer, impressed by the reserved pick-up lanes, white glove service – and the flying DeLorean – asks “what’s happening” and is told by Knight Rider’s Kitt “It’s the future, Michael.” It was a clever way to let more than 100 million viewers know that WalMart is betting big on next-level customer experience as a differentiator. The Pringles “Sad Device” ad promoted the brand’s many varieties with a voice-controlled smart speaker upset that it (she?) has no hands or mouth to build or taste the “flavor stacks”. The ad was one of many that highlighted AI not as a futuristic, nebulous concept but as part of our everyday lives. SimpliSafe’s “Fear is Everywhere” ad falls into the same category. Yet rather than a “sad” device, the commercial for the company’s home security system featured a “spying” device as one of the modern fears we as consumers have. It poked fun at our fears, real or imagined, about porch pirates, delivery drones, and robots coming to take our jobs. SimpliSafe is telling us that it understands the “creep factor” is real in how brands interact with us, and the ad is meant to reassure us that its product has our best interests in mind. Microsoft’s “We All Win” commercial for the Xbox Adaptive Controller, designed to help gamers with limited mobility. Children spoke openly and honestly about overcoming their physical disabilities and the importance of being treated as equals. While comedy seems to be the default genre for creating memorable Super Bowl ads, Microsoft took a gamble by showing us our own humanity, betting that by making us feel good about ourselves we’ll feel good about the product. It also showed us the power of technology for helping to better our lives. I would argue that these commercials were well worth the estimated $5.2 million cost (for a 30-second ad) that brands willingly pay to reach more than 100 million Super Bowl viewers, more than double some of the highest-rated sitcom finales of all time. (Last year’s game averaged about 108 million viewers). There is also ample evidence that the ads are effective. According to a National Retail Federation (NRF) survey that spanned 10 years of Super Bowl viewing, last year 19.3 percent of respondents said that Super Bowl ads made them more aware of advertiser brands, up almost 3 percent since 2008. It was about the same increase for respondents who said that the ads influenced them to search online for more info (up 3.4 percent) and influenced the viewer to buy more products from the advertisers (up 4.3 percent). An effective ad, as measured by share of digital voice, social impressions, and online views, is one that is talked about, analyzed, and dissected as much or more than a game-changing play, and that’s why we are now seeing brands coming up with innovative new ways to engage with the audience. Methods include cross-over promotions, personalization, and integrated marketing campaigns with strong social media tie-ins. Bud Light and HBO teamed up for “Joust” that featured the Bud Light Knight doing battle with The Mountain from “Game of Thrones” to promote the HBO program’s upcoming final season. If you’re a Bud Light drinker who also watches “Game of Thrones” – and it’s a safe bet that the brands wouldn’t have shelled out $10 million for the 60-second spot without knowing precisely who their target audience is – then you probably viewed the commercial akin to a personalized invitation. The ad was an example of brands targeting consumers based on preferences – the more a brand knows about its customers, the more effective it can be in delivering a relevant experience. T-Mobile crossed off the personalization and the cross-over boxes with a series of ads – one each quarter – in its #AreYouWithUs campaign. The commercials featured text message exchanges that people can relate to – a conversation about dinner plans, a daughter confounded by her technology-challenged dad – that the mobile carrier tied into its long-standing T-Mobile Tuesdays promotions. After the dinner exchange – Sushi? Tacos? – the commercial revealed a Taco Bell giveaway. Another commercial ended with an offer of a $10 Lyft discount. Of course, to redeem the freebies customers must download the app. With the offers, T-Mobile is actually putting a price tag on what it’s willing to spend in exchange for your personal data. 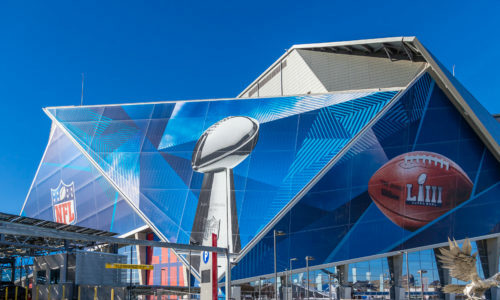 Early results of Super Bowl LIII ad effectiveness are in, and one of the biggest winners was Audi, whose “Cashew” ad used the Heimlich maneuver to promote its e-tron GT electric sedan. The ad boosted traffic to the e-tron GT site by 13,678 percent according to Drive Time, with a 116 percent spike in traffic growth. Toyota’s “Wizard” ad (featuring the Who’s “Pinball Wizard”) to promote the new Supra saw traffic to the Supra website jump 13,000 percent. Among car manufacturers who advertised during the game, the commercial garnered the highest percentage of online activity following its ad. Maybe the low-scoring defensive slugfest between the Patriots and the Rams drove viewers to the Internet, more excited to conduct digital research than to watch punt after punt after punt. Not every Super Bowl is going to be an offensive juggernaut with teams trading touchdowns, but those tend to be the ones that live on in our collective memories. We measure the success of Super Bowl ads the same way – if it’s remembered, it worked. I’d love to hear what you thought of the Super Bowl ads. What struck a chord? What flopped? Are you now in the market for an Audi e-tron GT? Leave us a comment below to keep the conversation going.